Here is my random advice. I used to work for a company that had a really aggressive virus scan. It wanted to scan every .jar in ColdFusion every time there was start of the server. To get around it. I would start it on the command line. Stop it on the command line, then restart it as a service. Steve, when you say cf won’t start as a service, do you mean you get an error in the services panel? Or that some page (perhaps the admin) doesn’t load? And are there any lines in the cf logs when you do try to start it that way? OK, Steve, I have assessed the logs, and from what I see, it will be very hard to resolve this issue here by email/comment (in my opinion, at least). So I will re-assert my suggestion that we may be able to solve this via a remote screensharing session. There are various things I would propose to look at more closely, and those things are just too complicated to relate here in comments. As I said in my earlier comment, I do offer a satisfaction guarantee, so you would not pay for time you did not find valuable. Again, if interested, see the consulting page at carehart.org. Or perhaps someone else will have an idea for you. 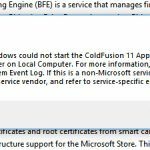 What user do you have listed in the login tab of the windows service definition for cf? If it’s not system, then has the listed user been given permission to the cf11 folder? Steve, since you allude to this being related to having applied a CF update, my bet would be that there was an error in applying the update. I have a blog post about it, with details of both how to find if there was (not obvious) and what to do to recover (also not so obvious). Let us know if that gets you going.